The tour of the island with guide on board. Different stops to pause and admire the amazing island of Ischia including a special stop, at EXOTIC PARK MEDITERRANEAN "RAVINO" (with guide inside). 8 stops during journey, a long stop in S. Angelo. To remain fascinated of its original conditions where many fishermans houses have remained the same as they ware. All with guide to have information on all the areas in which we stop or pass. To discover the island of its origin volcanic, today rich of vegetation and thermals. 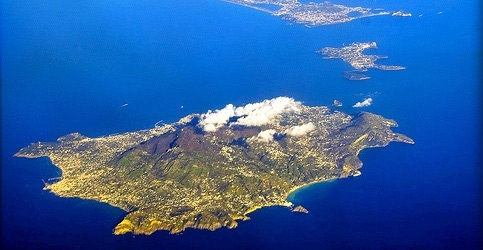 A guided visit to understand the Ischia thermals and its benefits. First stop at CARTAROMANA to admire the rocks of S. Anna and the castle Aragonese. CAMPAGNANO, TESTACCIO and very near the beautiful bay of MARONTI, spring water of NITRODI. calcium, carbon, chlorine, potassium, sodium and sulphur. The beneficial of this water are numerous: helps and regularizes the diuresis, inproves the functionality of the kidneys, making the skin healthy and bright. (Who would like can bring a bottle to fill up at the springs). LAST STOP MONTE ROTARO with Cratere "FONDO D'OGLIO" where there are still evidence of the nature volcanic (FUMAROLE). Strolling in the opening of a crater out, one of the places very charming and remote of the geothermic of Ischia. For whom wants to view the most enchanting places of the island, under soft lights, a fascinating atmosphere and romantic. Departure 21.15 (Duration around 3 hours). Little tourism therefore very few hotels, the island has always been a place of tranquility and peace. Travelling on these small vehicles, threw the small narrow streets. The characteristic of this enchanting place is lined of house tall and coloured, arches and stairs that have always been a example of the simplicity of the rustic elegance that reflects heart and spirit of the procidans.